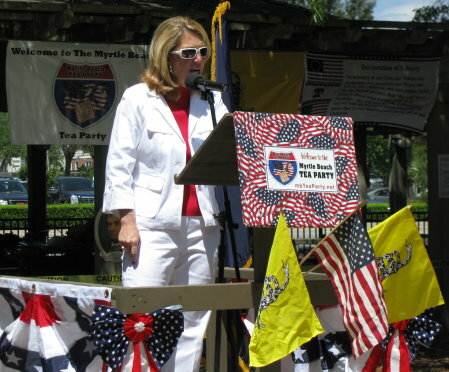 They had another Myrtle Beach Tea Party last Saturday and I was one of the people giving a short speech. Unfortunately, it turned out to be a much smaller event than usual. 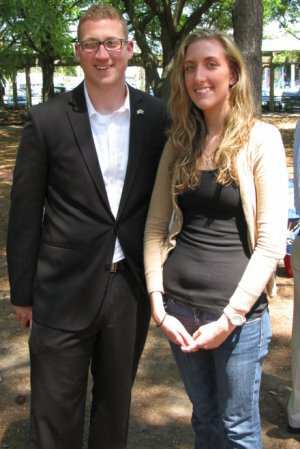 Most of the Tea Parties I’ve been to in Myrtle Beach have been in the 300-500 people range. This one was probably more like 150. So, for whatever, the numbers were way down from normal. Not a good omen, but on the other hand, one lightly attended Tea Party does not a trend make. Here’s the video of my speech, followed by the text of the speech as written, and a few pictures from the event. My name is John Hawkins. I run Right Wing News .com and write columns for Townhall, and I am honored to have been given a few moments to speak to you. Now, I have been to some Occupy protests to see how the other side lives. I was in Denver when the police ran 300 dirt hippies out of the park. I’ve also taken a stroll through Occupy DC and I can tell you there are some differences. 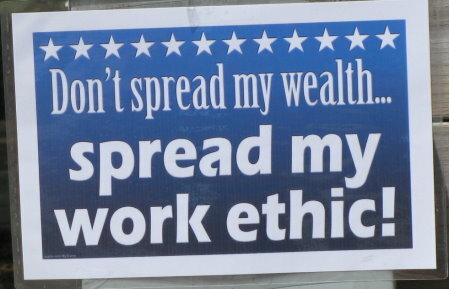 For one thing, I don’t see anyone here with his hand out asking everyone else to pay his bills. I also haven’t seen any rats — and, yes, I really did see a rat at Occupy DC. Perhaps most importantly, there also aren’t any tents that smell like a dog died in them last week; so if you were wondering how you stack up to the liberal version of the Tea Party, well, there is o comparison. 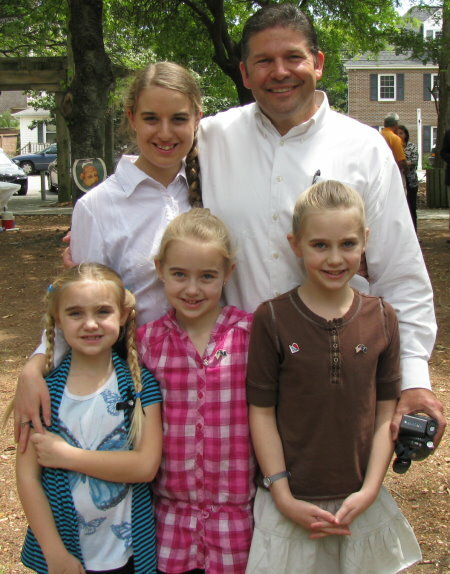 Now, I’m here to talk about accountability — the sort of accountability that the Tea Party enforced in 2010. In 2010, the GOP had its best year in a half century. That wasn’t because the Republican Party is so great, it wasn’t because some brilliant strategist came up with a great idea, it wasn’t because we had such great candidates, it’s because of Tea Partiers like you who didn’t like what was going on in D.C. and decided to do something about it. But, of course, as long as Barack Obama is in the White House, we have more work to do and he is much closer to taking this country over the side of a cliff than most people realize. Congressman Mike Pence, who is one of the good guys in the House, has told me he thinks this country could default on its debt within a decade. Senator Tom Coburn told me he thought it might only take five years. Herman Cain, whom I interviewed last week, told me that he thinks if Barack Obama’s 10 year budget is adopted, America could default on its debt by the time it’s done. The bad news is that even if we get Obama out of office, our work isn’t done. Now, if we had a Congress full of conservatives who put their country first, men like Jim DeMint, our problems would be over once Obama is undefeated. Unfortunately, most of the Republicans in Congress are more like Lindsey Graham. In other words, they are arrogant, complacent, and don’t have the courage of their convictions. In fact, the only reason most of them are willing to do the right thing is because they’re afraid of you. They’re afraid that you’ll primary them and vote them right out of their cushy jobs. Folks, since America was founded, there have always been Americans who were called upon to shoulder the burden of saving this country — the citizen soldiers who fought with George Washington, the Texans who gave their lives at the Alamo, the men who went overseas and saved not just America, but the world during WW1 and WW2. Now, their legacy and their burden has fallen on your shoulders. One hundred years from now, when historians are looking back at today, they’re going to write one of two things. They’re either going to say, “This was when the Tea Party rose up, held the politicians in D.C. accountable, and saved the country” or they’re going to say, “This was when America started to decline, this was when the American dream started to die, this was the last time America was a good place to call home.” After everything our country has done for us, we have to do what we can, with what we have, where we’re at so that when those history books are written, they remember us as the heroes who saved our country, not the first generation of Americans to let our country down when it mattered most. Your country is counting on you. Don’t let her down.